A relay is a kind of switch which is controlled by an electric current. A relay makes it possible for a low voltage low current circuit to switch a high voltage and/or high current device safely – for example, a small battery-powered light detector circuit can be used to control large mains powered security lights via a relay. Many of the circuits we sell in the REUK Shop and describe in the articles through this website can be used with to control mains powered device such as pumps and lighting with the addition of a suitable relay. For example, our commonest request is for a solar water heating pump controller circuit which can switch a mains powered circulation pump. 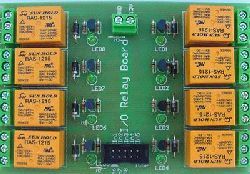 Rather than adding a mains switching relay to our circuits directly, we recommend that people use arelay board – i.e. a commercially manufactured circuit board fitted with a relay, LED indicator, back EMFpreventing diode, and easy to use screw-in terminal connections. These are now available more cheaply than we can make them ourselves (and if you electrocute yourself with mains electricity we are not liable!). The simplest relay board has just one relay, one LED used to indicate the status of the switch, one suppression diode to prevent back EMF from damaging connected electronics, and screw-in terminals for the voltage inputs and for the NC, NO, and COM connections on the relay. Pictured above is such a relay board recently offered for sale on ebay UK Priced at under £5 including postage, this relay board can accept an input voltage of 12 VDC and 24 VDC, will switch mains electricity at currents of up to 8 Amps, and is double pole so you can use it to switch two devices on or off at the same time. * A screw lidded plastic box was offered for sale at the same time for £3 which would keep everything safely insulated. For many projects there will be more than one relay required – for example in solar trackers where 2+ (high current) motors must be controlled if the solar panels fitted to the tracker are to follow the Sun’s motion across AND up and down the sky. For such eventualities multiple relay (aka multi-channel) relay boards are available. These can have anything from 2 to 16 relays fitted to the same circuit board to make it easy to keep everything safe and tidy. Pictured above is an excellent relay board with eight (10 Amps at 250 VAC switching) relays. Each relay has its own transistor and the circuit board has a 12 VDC connection – therefore, just a low-current signal voltage is required to control each relay. 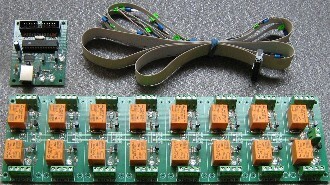 This type of relay board is therefore very well suited to microcontroller applications such as PICAXE based projects. The 8 relay board pictured was priced at £15 plus £3 for delivery (from Bulgaria). Similar 2, 4, and 6 relay boards were also available with prices at approximately £2 per relay. 16 relay boards are available here for as little as £7 including delivery from HK and China. 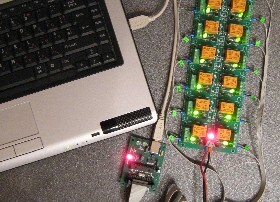 For those with more advanced requirements, relay boards are also available which can be controlled directly by USB or serial connection. Pictured above is a 16 relay USB controlled relay board* package, sold recently on ebay UK (from Bulgaria) for £50. The small secondary circuit board at the top left of the above picture is the USBadapter board. This is powered directly by the 5 Volts from the PC via USB cable, and has amicrocontroller (PIC16F876A) which interprets signals from the PC and opens or closes relays accordingly (via pictured flat cable). * Note that the relay board itself is simply the 16 relay version of the 8 relay board discussed above). With this relay board connected to a LAN or internet connected PC, it is even possible to control the relays remotely – conceivably from anywhere in the world – with freely available software or easy to learn BASIC commands! If you would like to purchase a relay board take a look first at the latest listings for Relay Board on eBay UK. 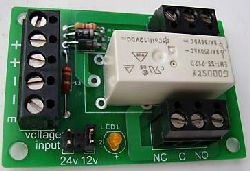 A second search for Channel Relay often picks up additional relay boards as does Relay Card (which recently found this economical one relay kit pictured below). For a great value computer controlled 8 relay board kit (8 x 3A @ <25VDC relays) – click here to view this 8 channel relay board priced at £15 + VAT. It comes supplied with Windows software and connects to PC printer port.